You may remember that last year DWT formally complained to the FEC and the Office of Congressional Ethics about a crooked Patrick Murphy contributor named Nicholas Mastroianni II. In June of 2016 I wrote about the complaint and published the official complaint here. As I wrote at the time, our complaints centered on how Mastroianni was paying Murphy off for his help in corruptly using the EB-5 visa program that Murphy has pushing in Congress. 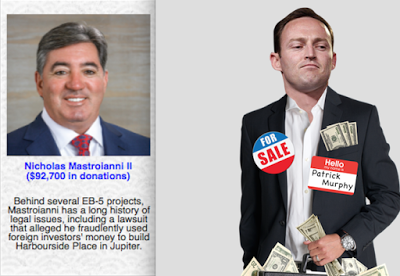 Basically, we were quite certain that Mastroianni had orchestrated a scheme to funnel more than $100,000 into Murphy’s political campaign efforts by using shell companies and straw entities to hide the source of the money, which appears to be coming from Chinese nationals participating in Mastroianni’s EB-5 visa-for-sale program. Shell companies were already being broadly scrutinized for being possible illegal donor entities under the law. But more importantly in this case, Chinese nationals cannot legally make contributions in federal races. 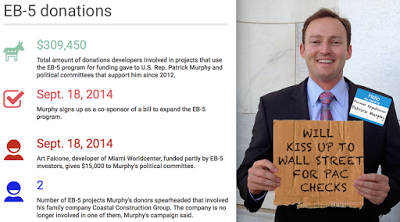 We complain about the help the Russians gave Republican Donald Trump... but what about this Chinese cash being funneled into Democrat (barely) Patrick Murphy? 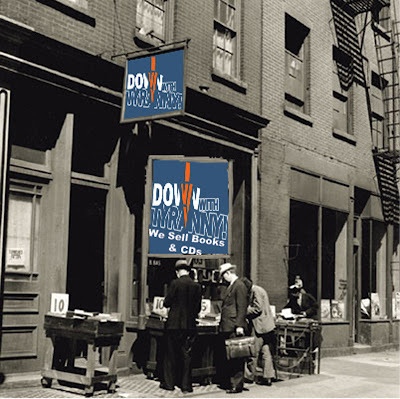 This week we finally heard back from the FEC-- like 36 pages of legalese claptrap. I finally got an attorney to help me put it in English. So again, Mastroianni had been taking in foreign partners in the EB-5 program, and buying real estate. In one case, the real estate partnership made the contribution to Murphy’s campaign, not him. Foreigners can’t contribute. When Mastroianni was challenged on it, he said, in essence, "you haven’t proved that my partner was foreign." The FEC didn’t bother to ask him whether his partner was, in fact, foreign. Instead, they just said, in sum, "the papers before us don’t prove that Mastroianni’s partner is foreign, we are not going to bother to ask, and therefore, we are dismissing the complaint." A member of Congress sent me a note about this post the day after I wrote it. It included these painfully honest lines: "That’s accurate. The last thing that either party wants right now is to focus attention on the illegal contributions that both take... with a smile."